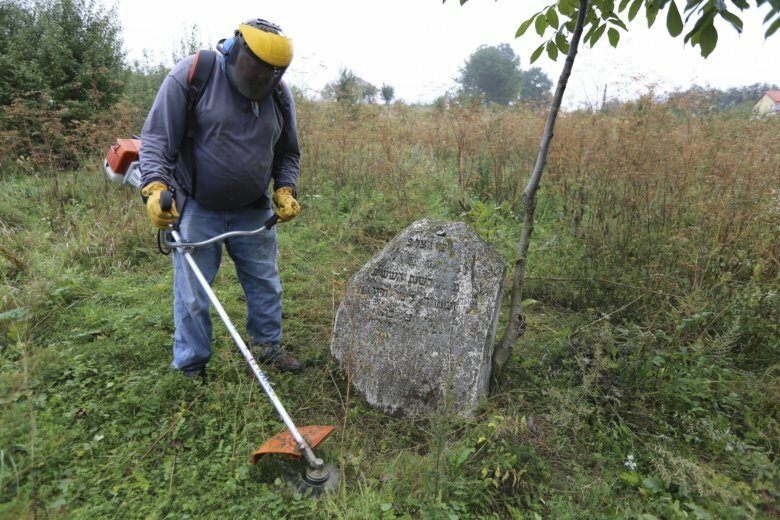 ROHATYN, Ukraine (AP) — Steven Reece pulls a shield over his face, takes a weed whacker in hand, and begins trimming tall grass in an overgrown, tick-infested Jewish cemetery in western Ukraine where tombstones lie toppled and broken. For years now, Reece, an ordained Southern Baptist minister from Texas, has been cleaning Jewish cemeteries and erecting memorial plaques at mass grave sites in Poland, and recently Ukraine. The region, once Europe’s Jewish heartland, saw millions of Jews shot and gassed by Nazi German forces during World War II, sometimes with the help of local collaborators. The 63-year-old American says cleaning up old cemeteries is his way, as a Christian, of honoring Holocaust victims while supporting the surviving Jewish communities here. He also hopes his mission can help alleviate the bitterness and misunderstanding that still festers sometimes between Christians and Jews. Reece explains that he is troubled by the failure of European Christians who mostly stood by passively as the Nazis marginalized, then persecuted and killed their Jewish neighbors. “To me it means simply bringing together people who are separated by distance, by space, by conflict,” Reece said, taking a break during a recent clean-up operation in Rohatyn, Ukraine, which before the war was part of Poland. Outside Ukraine, Reece and his team cleaned seven cemeteries in Poland this summer, including one in Oswiecim, the town where Nazi Germany ran the Auschwitz death camp. Reece, who grew up in Texas and is now a resident of Peachtree Corners, Georgia, says he is driven by a desire for justice that has been with him since his boyhood in the American South, where the mistreatment and segregation of Black Americans was instituted in law. Part of his mission involves encouraging diaspora Jews to work with local volunteers in Polish towns to continue the cemetery maintenance work. In 2010 he founded an Atlanta-based charity, The Matzevah Foundation, which takes its name from the Hebrew term for headstone. The foundation brings volunteers to Europe from the Brentwood Baptist Church in Tennessee and partners them with Jewish descendants to care for their ancestral cemeteries. Since 2012, his organization has carried out 28 projects in 14 different locations with the help of nearly 1,000 volunteers, including some 250 Americans, but also Israelis, local Poles and Ukrainians. The recent work in Rohatyn was organized by Jewish Rohatyn Heritage, an organization run by an American couple, Marla Raucher Osborn and Jay Osborn, who have been gathering Nazi-damaged headstones scattered in the town and bringing them to the cemetery in Ukraine. Reece first came to the region in the late 1980s when he was on assignment in Poland as a photo reporter. After graduating seminary, he served for 12 years as a pastor in Warsaw and nearby Otwock, learning Polish and gaining a deeper understanding of what happened in Poland during WWII. The country was invaded from the west by Adolf Hitler’s forces and from the east by Soviet forces. More than 5 million were dead by war’s end. Under the German occupation thousands of Christian Poles risked their lives to help Jews, but many did not act, and some joined the plunder and destruction. Reece, no longer a minister, says he wants to help local Jewish authorities struggling to maintain 1,400 cemeteries across Poland — a legacy of a country once home to the largest Jewish community in the world. That population has dwindled from 3.3 million on the eve of Germany’s invasion, to 20,000 today. Mass grave sites continue to be discovered, and the challenge is made more difficult as Poland’s economy grows and construction booms across the country. Reece said some in the Jewish community at first wrongly suspected he was seeking converts. Poland’s Chief Rabbi Michael Schudrich said that initially, some were puzzled by Reece. “Steven is so unique, we’re not used to people like that,” he said. Gera reported from Warsaw. Associated Press investigative researcher Randy Herschaft contributed to this report.